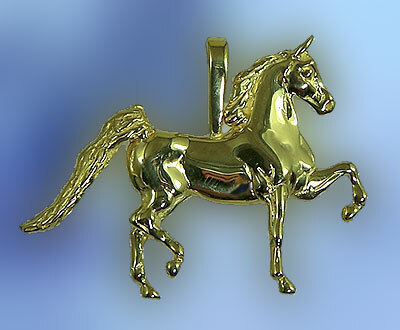 Morgan Horse Pendant would make a great gift for any Morgan horse lover. The Gorgeous Horse is your number one source for custom Morgan jewelry. This Morgan horse would make a great addition to your slide or to your omega. This design features exceptional two-dimensional detailing, a true representation of your horse showing in the arena. Dimensions: 1 7/8 inches wide x 1 1/4 inches tall. Available in 14kt White Gold, 14kt Yellow Gold, and Sterling Silver.